Within this volume, Brooks, McCormack and Bhopal set out show how the sociology of education can cast a critical eye across the global issues in education from schooling through to university in the mainstream and to the margins. Opening with an outline of the theoretical, political and institutional contexts of the sociology of education, the book gets the reader up to speed with the state of the field before taking them on an editorial journey through the various stages of education by way of an interesting and thought provoking range of chapters based on cutting edge empirical research. There are a number of chapters on compulsory age schooling examining issues of international comparisons in assessment, citizenship education, academic selection, masculinities, race and gender issues in schools. The most poignant chapter on schooling comes from Carolyn Jackson who explores the issue of fear and anxiety in schools. This is one of the few chapters that focuses on teachers as well as students, an area that on the whole the collection glosses over. Recent debates surrounding increasing pressure from inspection and policy change on education professionals would suggest that this is an area central to contemporary debates. This however, is a comment as much on the speed of change and the current state of research in the sociology of education as much as it is the book. The most interesting chapters are those that take the reader those beyond the scope of other texts. Firstly, Kagendo Mutua and Sandra Cooley Nichols chapter on special education in the USA and how gendered identities are constructed within it during adolescence which takes a very different stance on exploring special education provision beyond outcomes and process to explore how individuals develop a sense of identity. There is also an excellent chapter by Steve Roberts focusing on the lifelong educational opportunities of retail workers where he explores the tensions of between an instrumental credentialisation of skills and learning that is useful for life. This chapter is an important contribution as workplace learning is often omitted from debates in the field. That said, no volume on contemporary debates would be complete without the obligatory chapter on working-class students and university. Wolfgang Lehmann provides this from a Canadian perspective and this highlights another key strength of the volume that in drawing from global perspectives, it helps the reader create a comparison of similarities with more local debates. This is complemented further by Heather Mendick’s exploring issues of the gendered nature of subject selection in Mathematics. Understanding these processes is key if issues of equal access based on gender are to be addressed within STEM subjects. The final chapter by Keri Facer and Neil Selwyn is a provocation highlighting issues of technology and the importance for sociologists of education to be ready to explore these. They argue that given the ubiquity of technology within all areas of education, that there is sizeable gap in the research literature. In ending on this note, the volume challenges the reader to consider how they can fill this gap and hopefully will act as a stimulus for much needed work in the sociology of educational technology. This collection serves its purpose of stimulating thought on the contemporary debates of the sociology of education and as such would provide an excellent starting point for those new to the field or who are currently engaged within education but would like to explore a more sociological analysis of some of the issues and challenges they face. Ever since he threw the initial idea out there on his blog, i’ve been intrigued by David Beer’s Punk Sociology project and after reading it I wasn’t disappointed. It is one of the Palgrave Pivot titles that exist to bridge the gap between a journal article and a monograph. As such it is not an onerous read at a mere 76 pages but within those packs a huge amount of ideas and provocation that has the power to re-inspire a generation of Sociologists. Whilst framing the argument in terms of Punk is certainly novel, much of what Beer argues is not new, in fact it is what Mills and Becker have previously argued for extensively and yet, Punk Sociology appears as a fresh ‘call to arms’ and one that has never been needed more than in an age where metrics and measurement are becoming so important that there could be a tendency to play it safe to ensure research solely fulfils the criteria of excellence set down by the academy. Part 1 sets out the background of the challenges and opportunities that Sociology faces in today’s academic climate but focuses not on the problems but potential solutions. It does this through a whistle stop tour of Punk ethos. this is consolidated through examination of how the ethos could be used to re-imagine sociology and to revitalise the discipline. It is not a handbook of solutions, but a series of provocations that will help the reader to think about their own work in a new light. Through this method of provocation, it is equally applicable to other social sciences and any one from the fresh undergraduate student to the most experienced of academic. My only regret about the text is the accessibility of its distribution. The message it has to share is so vital that it is a shame that it comes at a prohibitive cost. Notwithstanding this, I would argue that this should be an essential text for every potential and practicing Sociologist in hope that the call to arms and the provocation it provides will engender the seed change that Beer argues for. After unashamedly taking an idea from Mark Carrigan and running with it, I thought I’d share not what I’m reading but what I’ve read over the summer. Some of them I’ve blogged about, some will be the subject of future blogs no doubt. Mind you with only a few days left and a book still to finish, I better get back to it! 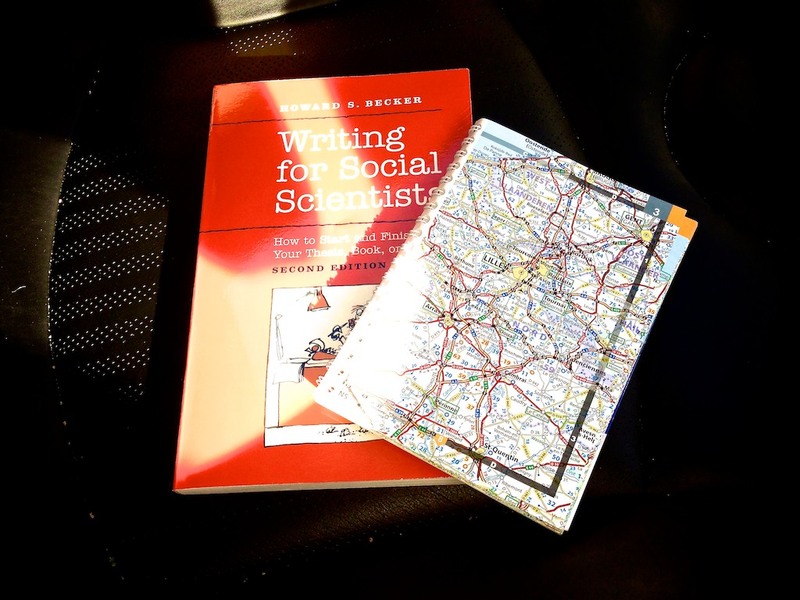 What can Becker’s Writing for Social Scientists teach us about blogging? 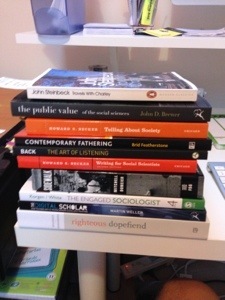 Recently a few other bloggers including David Beer had mentioned Becker’s Writing for Social Scientists. Having been a fan of his style of writing since I first discovered Art Worlds a few years ago, I was keen to see what sagely advice he had to offer. Interestingly, much of what he suggested are things I already do. Interestingly, the way he suggests writing for getting words down, regardless of quality and worrying about that later is something i’ve always done. I can see how this, to some people would be an huge leap from their current way of working. I never got on with planning in the traditional sense, preferring to get stuff down and them look at how to shape it and it was a relief to see i’m not the only one. Interestingly, this relief at seeing commonalities between what others do and how beginning academics work is something Becker stresses in the book and I would whole heartedly support this. It was no surprise that seeing it sitting on my car seat next to a map was a light bulb moment as it felt like the guidebook that had been missing from my writing. I had figured most of it out already like any explorer of a new place often does, but it was good to see that I hadn’t missed anything important. I think this is the key reason to read this book, if you aren’t sure how to make your writing better then it will help but if you think you know but have niggling worries that you aren’t on the right track, it can help reinforce those ideas. This second edition examines some of the changes in technology in the twenty years since it was first published, especially in terms of ways in which computers have enhanced the ability for drafting and rearranging ideas and the reduced permanence of the text that is churned out, allowing for writers to take more risks with what they put into being. This, combined with some of his lines of argument about the value of sharing and discussing writing lead me to thinking how the rise of blogs have changed the game even further since 2007. Becker uses a lovely phrase in chapter three. He says ‘A thought written down is stubbon, doesn’t change it’s shape and can be compared to thoughts that come after it’ (p.56). For me, this forms the crux of why I am finding blogging so valuable for my writing, it allows me to commit those ideas to writing and to share them with other people, not only my close academic network, but more widely. It allows me to ask questions, to float partially formed thoughts and to help develop the thinking by continuing to write about them. This is what many academics have down for years in letters and through discussions so why, in some cases is there a resistance to blogging still by some people? Becker poses a possible reason why, he says ‘There’s something that I think many of us believe: talking about work is less of a risk than writing about it. In part it’s because no one remembers the ideas you speak.’ (p.118). I wonder if it is an extension of this argument that keeps the discussions in private opposed to in the open on a blog. Maybe if you do not make public your partially formed ideas, people won’t remember all the wrong turns you took., after all, your audiences only want to hear the perfectly formed ideas, not those provisional ones, right? Of course, this is just my interpretation of how his work be translated to the risks and fears of blogging and how blogs can offer ways to address some of the concerns of writing he raises in the book. Maybe he would speak differently? Briefly, It is divided into 11 chapters, each taking a similar format followed by a final chapter that suggests some potential research projects which allow practical engagement with the aims of the book. The remaining chapters consist of a section of theory or background relating to sociological concerns or debates, an example of how a real life Sociologist (ranging from students to professors) has worked within that area to affect change, some exercises to put the abstract issues into real life contexts and related discussion points, and finally, some suggestions for ‘actions’ to use the knowledge of Sociology in the readers own community. The book is written in a clear and accessible way, but is clearly aimed towards undergraduate students in its scope and delivery. It is supported by an excellent website which provides some resources to help support the practical activities and as such would make a good teaching text. What is does extremely well is shows the reader the value and implications of Sociology beyond the classroom and academia. The book does, however, have its limitations. firstly, it is extremely US centric in its content. It constantly refers to US policy and examples that may seem alien to the average student outside of the continental USA. This is not to say the book is not useful for students across the atlantic, far from it, in fact it certainly enhanced my knowledge of issues that I had little knowledge of before. It may, however, need to be enhanced with examples in a more local context if it was used as a core text for a course in the UK for example. This us-centricity seems to carry through to the theorists cited in each chapter with notable omissions of Bourdieu and Foucault to give two examples. Nonetheless, the book does fill a gap relating to the “so what?” question that faces many academics when teaching a introductory sociology module to students from a range of disciplines who do not as yet understand the value and power of Sociology. Whilst the americanisation of the examples might be too much for some to bear, especially if considering its use as a core text, it certainly has a value in every lecturers bookcase as a point of reference for some excellent, engaging teaching ideas that bring Sociology to life.